• GMO OMG premiere – standing room only! GMO OMG premiere – standing room only! 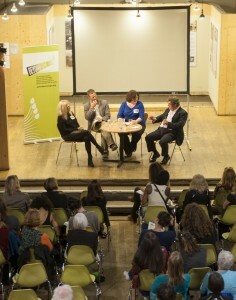 It was standing room only at the recent London premiere of the award winning film GMO OMG, hosted by Beyond GM. 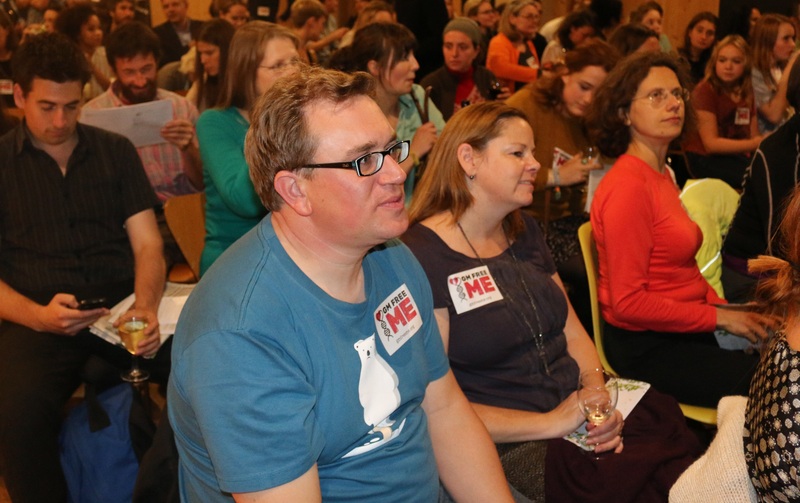 We welcomed over 130 people through the doors of The Garden Museum on the evening of Friday October 10 to eat, drink, watch and ask questions about GMOs, seed sovereignty and the future of food. 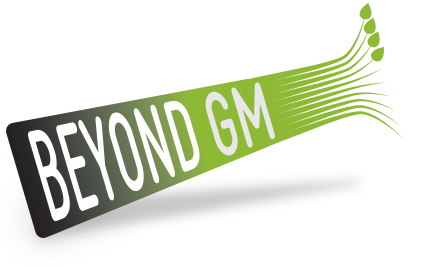 The evening marked the official launch of the Beyond GM campaign as well as the beginning of The Great Seed Festival and was so well attended, that many people ended up standing in order to view the documentary. The American film, which scooped the best documentary feature film at the recent 24th Annual Environmental Media Association Awards in California, follows a father of three, Jeremy Seifert, as he travels across the US trying to find answers to his questions about genetically modified food. 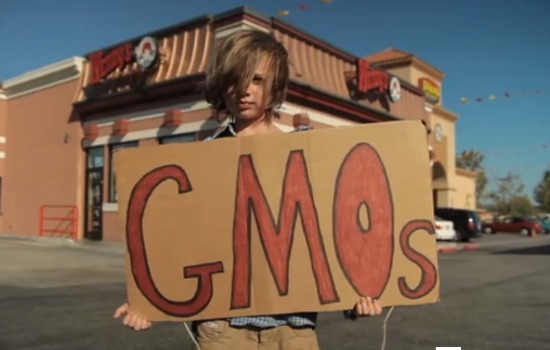 Along the way, he discovers that 80% of all processed foods in American supermarkets contain GM and even the trout his kids reel in on a wilderness fishing expedition have been fed on GM ingredients. Seifert’s honest and very human approach to this complex subject is what makes the film so appealing and by the end of the evening it was clear it had resonated with many people in the audience who also have concerns. The film sparked a variety of interesting questions and comments from the audience, which stayed behind to take part in the panel discussion, chaired by Beyond GM campaign director and former Ecologist editor, Pat Thomas. Pat was joined by fellow campaign director, Lawrence Woodward; farmer and founder of the CSA Chagfood in Chagford, Devon, Ed Hamer; and organic entrepreneur and founder of Jo Wood Organics, Jo Wood. Commenting on the evening, Thomas said “I think everyone in the audience recognised a little of their own journey in that of the Seifert family. That meant there was some great questions for our panel, many of which challenged the much-touted notion that average people either don’t know or don’t care about GMOs. 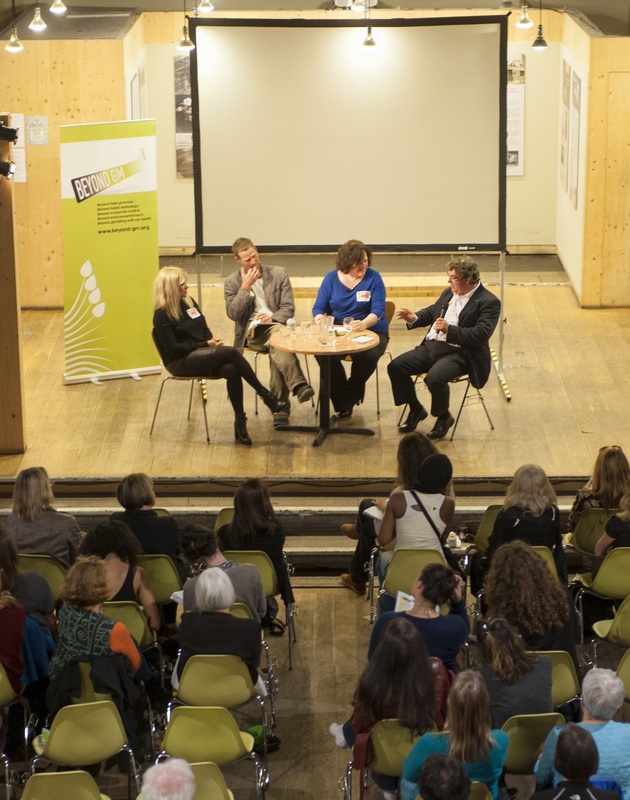 The evening showed that people do know and care and this public engagement – which is one of our greatest assets in the fight against GM – is what will help shift the tide of pro-GM propaganda in the UK and the rest of Europe”. Lawrence Woodward, a prominent figure in the organic movement and long-time campaigner added:” It was great to see so many new faces at the premiere. Lots of young people were keen to know more about GM and how it could impact on their food system, their daily lives and their futures. There’s a real thirst out there for more information and that’s what we hope Beyond GM can provide”. Although the evening focused on a serious subject, there was still time for a few drinks, a delicious organic buffet courtesy of chef Sylvain Jamois and good deal of banter. While everyone expected to learn something, many commented that they hadn’t expected to have such an enjoyable time doing so. The sense of community and open, engaged inquiry ran right through the whole of the London Seeds Festival, which attracted a varied and lively number of visitors over the weekend and following week. Among the many events and workshops visitors would have found Liz Hosken director of the Gaia Foundation explaining how community-led processes such as eco-mapping and calendar making has supported communities in Africa and the Amazon to revive their traditional seed varieties and related knowledge. Beyond GM’s Lawrence Woodward also delivered a rousing speech on the ills of patenting seeds for profit, urging citizens to take action in the UK and beyond to keep GM out of our fields and off our shelves. 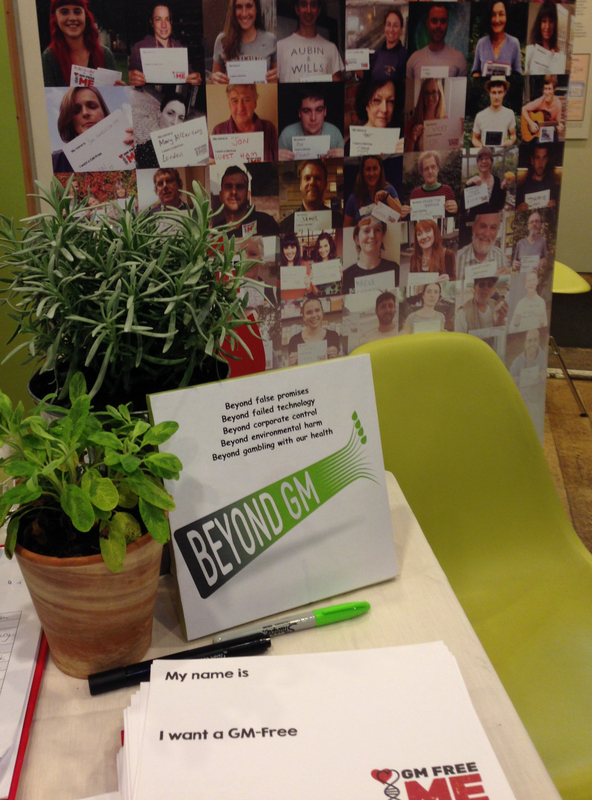 There was also a great deal of activity around – and support for Beyond GM’s GM Free Me initiative. 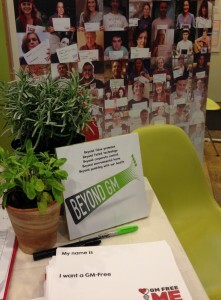 Many photos were added to this visual petition calling for a GM Free UK. Beyond GM will be hosting more events like this so watch this space!